I've been meaning to take pictures since last weekend when I finished planting my annuals. We are about to get another downpour but I decided to get outside and see what I could get done before it starts again. The goal here is yellow blue and orange. There are some yellow petunias that will be bursting out at the sides and fill in as the summer progresses. We just had a downpour and everything is a bit floppy. These are an all white "SunPatiens" which is an impatiens plant that can take the sun planted with some multi-color sweet potato vine that should hang gracefully around the pot soon! I'm flanking the steps to the deck with these pots this year. The ferns are working their way out and spreading- I need to remove a few. I planted one little Polka Dot plant with a piece of this Licorice Vine (Dichondra-Silver Falls) should be cute as it fills out. I potted these up with only these deep purple "supertnnias" which will spread and hang over the sides. I may need to put them up higher if they get going as well as they have in my larger pots by the garage in the past. They're going to stay positioned here by these steps. Almost nothing is flowering in this pot but it will be a soft pink lavender and white mix of colors when it gets going again. I've barely put any time into the Fairy garden. I moved the cottage over to this short wall so I can walk up to it and work on it more easily. A few weeks ago I moved a few plants that were just starting to emerge over next to the cottage. The dianthus is starting to bloom already! I randomly placed some violas around the stump for a woodland look and pop of color! I stored the little stump in the garage for the winter. I brought it out and was surprised to see this fungi that had grown at the base of the little chairs and table….pretty neat affect! This is where the Fairy garden cottage was last year. I moved in a large stone, adjusted a few plants and it's already filling in. This is going to be a flush of red and I used some yellowish/orange violas mixed in with it too. Do you see something in the center? I set a little swan in there for fun! The iris have sent up their flower stems and should be open soon. There will be a yellow on the left and a mixed blue/white one just to the right with the orange ones closest to the steps. I was hoping they'd all bloom at the same time…. please?? This woodland clematis jumped in my garden last year and happily came back! A little garden whimsy! I have a thing for flying pigs and we found this one through a catalog company and I couldn't resist. He swings around in the wind like a weathervane! This planter is loaded with some orange tulips, alyssum, fiber optic grass, sweet potato vine and a newer variety of lobelia called "superstar" that isn't supposed to mind the sun or stop flowering! YAY! Give this a few weeks and it will be full of color! My new planters with the blue/black Salvia (these in particular attract hummingbirds) orange geraniums and lime green sweet potato vines. I pulled them away from the overhang so they'd get the rain. My lilac topiary tree is loaded with blooms. Last year I stopped sheering it into the shape I'd been keeping it in and only trimmed it right after if flowered. That's what it needed and now it's ready to burst open with its' flowers! This one is just heavily to smell- in fact it tends to linger in the air and you can smell it at a distance! Love!! Looking down the path to the patio (everything looks a bit messy right now) The Astilbe on the left of the hosts have filled in the most that I've seen them yet. I still haven't planted these coral bells. Tomorrow- tomorrow! The Jack Frost Brunnera has continued to bloom and fill out. What a great shade plant! The hosts are filling out daily. The lime-light hydrangea shrubs were cut back severely last fall. They were getting too large so they got shortened a lot! Al the trees are dropping their "crud/seeds" and dirtying everything up. The bird baths look dirty but the Robin's still love to bathe in them! I'll get it cleaned up again this weekend. A new armillary piece Dan grabbed for me at a garden center. I've been wanting one for a long time! Just last week the green stone on the right stood there all by itself and now it's being hidden by the host already! The hosta closest to the center is the one I moved and is doing fine. We bought the wire garden orb last year and hung it from a chain but this year I got the idea to put it in a pot. I'm excited to see how this will look as it fills in! I planted this with orange and white impatiens. I debated on adding a vine and having it crawl on the wire but I really didn't want to enclose this so I decided against it. I'm keeping my ideas more simple this year- going with what I know works well! By the cement bench I added some violas to this "Foxtail Fern". They ferns did real well here last year but got so large that when I pulled them out the whole thing came in one piece and there was barely any dirt left! I bought smaller ones to start with this year. Back by the fountain I potted these planters with more of the orange and white impatiens and the purple Cordyline spikes. I've never tried them in shade so we'll see how those will do here. Nearby are these Japanese painted ferns that haven't amounted to much. This year they are showing up better (I was going to move them because last year they all but disappeared). They sit under this dwarf Japanese Maple tree. I thought it looked pretty from the underside so I snapped this shot. I added some orange wax begonias to the right side of the wall area. Did you figure out that orange is my color this year? Sorry these pictures aren't better…it's literally welling up and thundering out so I'm rushing through to take pictures. My little fairy has been standing guard now for about 4 years I believe! I wanted to paint her this year but she's so heavy I can't see lifting her out without destroying plants along the way. This Sum and Substance Hosta really lives up to it's name! It's better than 3 ft. across. This is my favorite planter this year! I spotted this statue and twisted Dan's arm for yet another new item this year (it wasn't hard to do). I have more of the orange wax begonias, white alyssum and the fiber optic plant planted in it. I think the fiber optic plant looks like water falling off the edge! This little guy looks old but he's not. It's a blend of fiberglass/resin and artfully painted to look old. I think I will stop here- as it's starting to rain again! Do you remember the movie Jurassic Park? In an early scene there was a wealthy British couple that had taken a spot on the beach to dine with their daughter. An elegant table had been set up by the ship's staff who were attending them. Well anyway I was inspired to do a table with that kind of beach setting in mind although I am a long long way from the beach so we'll have to pretend! This quick shot from the movie was the best I could come up with. Of course this was actually a scene that was leading to a very disturbing moment with some small chicken sized dinosaurs attacking their daughter- let's hope we don't have that happen! I mixed a few pieces together representing beach colors and themes. I rolled the napkins starting with a pointed corner and used the napkin rings to hold the final piece in place. The white dishes are trimmed with loops of rope and the pastel blue/green plates remind me of the color of the ocean. The striped plates make me think of those cabanas along the beach for changing your clothing and the napkins are reminiscent of king crab legs! I made this lantern arrangement a couple of years ago for my den as seen "here". The candle is described as having jasmine, gardenia, melon and white lilac. There is a wonderful smell drifting around the room right now- love it! I never imagined I'd be tying in the blue/green dishes with this lantern. This is something tablescaping has taught me- mix different patterns together- it's ok that they don't match! Love this stemware. The soft blue and green is perfect for this table and I've used it for others that had a completely different theme. The glass candle votives were from the Nell Hill's on-line site back when they used to sell things that way. 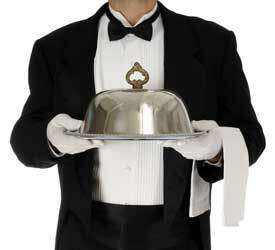 We'll pretend that our staff is going to serve us in the most elegant fashion! Thank you for joining me - now let's enjoy! Memorial Day was on and off rain all day. After we ate I felt like doing something so I put together a little tray vignette. Roosters, lemons and boxwood seem very French like to me! This oversized white rooster has been difficult for me to find a permanent home for but today he's anchoring my vignette! I wanted to add something else white so this little milk pitcher worked in nicely. The napkin took the place of flowers! Some of you that follow me may remember this little metal basket and the two cow plaques that lost their spot when I re-did the wall where the plate rack is now. You can see a post with the basket "here" and the plate rack "here" I thought this added a nice country appeal to the vignette. This preserved boxwood is a little find from Pier 1 a while back. The lace doily hitched a ride to my home via a tablecloth that got bundled up at my Mom's when I visited for Mother's Day- see that post "here". I couldn't leave this on the table because it's too large for everyday use but I did relocate it and I'll share that soon! Memorial Day Weekend Buffet Dining!